Do you feel that homemade ice cream just isn’t rich enough? Do you make it with cream, whole milk, egg yolks and sugar, but still feel that something’s missing, calorie-wise? 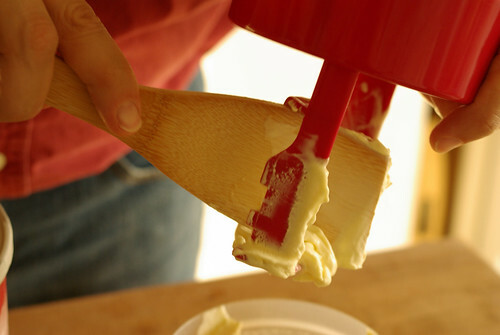 Then this is the recipe for you: mascarpone ice cream. We got this, of course, from David Lebovitz. 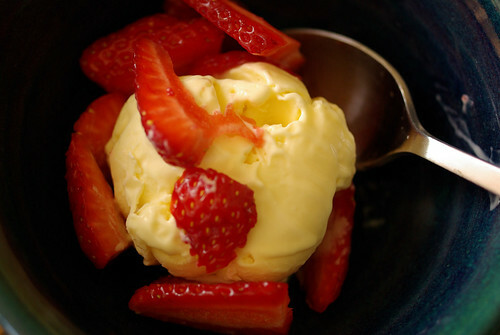 It’s a variation on his crème fraîche ice cream, which also sounds magnificent, but we had some mascarpone left over from making Elise’s strawberry mascarpone tart, and you don’t want to waste mascarpone, do you? Jon halved the recipe (or two-thirded it, or something), but it was so rich it still took us days to get through it. Some of it we ate with fresh strawberries, which was of course lovely, but it was best on the first night, when we made affogato. We scooped it out of the machine into bowls, then poured hot espresso over the top. It began to melt instantly, of course, necessitating hasty consumption, but that really wasn’t a problem. The swirls of cold ice cream and hot coffee dance together in the bowl, creating one of the best desserts on earth. Warm milk, sugar and salt in a saucepan. Whisk together the egg yolks in a bowl. Pour the warmed milk in, whisking, then pour everything back into the saucepan. Cook over medium heat, stirring constantly, until thickened. Strain and cool. Chill. Whisk in the mascarpone, then freeze in your machine. Get a pot of espresso going (or whatever strong coffee you like best). 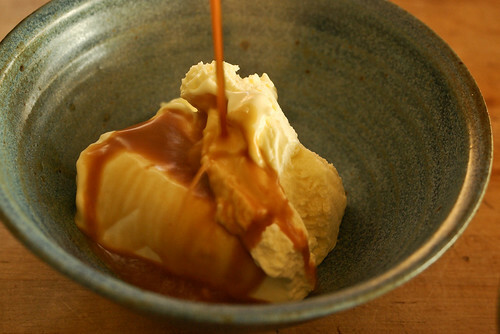 When the ice cream is ready, scoop into bowls and pour hot espresso over the top. Eat instantly. Next > best. falafel. ever. Wow. I had completely forgotten about this ice cream. We didn’t really make much ice cream this past summer. It was kind of a weird summer in many ways. But if we ever have a day that feels like it wants ice cream, it might be time to try the creme fraiche ice cream. Made into affogato, of course.